Child care Glastonbury: Celebrate Valentine's Day With Us! Celebrate Valentine’s Day at Our Child Care Center! Valentine’s Day is a holiday parents and children can celebrate one and the same. If you are the parent, you can spread the love and celebrate your husband, wife, or significant other by doing something special for one another. For your child, they can celebrate by having a special day at our child care in Glastonbury! We love to make Valentine’s Day an event at Foundations for Learning. We host a party that’s fun themed with healthy snacks, gifts for the students, and a lesson all about what this day truly means! In this post, we wanted to inform you why we think celebrating Valentine’s at our child care is important for your children. When we celebrate Valentine’s Day at our child care center, we make sure all our children feel the love. We ask that the parents help the children provide a gift or valentine for everyone in the class. We ask that each child get a gift so that no one feels left out or not included. An easy way to provide for everyone is to purchase valentines and have your child sign each one. If you are not wanting to buy valentines, you can have your child draw or color a picture for each child in the class. If you want to get creative and have a craft session with your child, you can use other materials to make cute and unique gifts for their classmates. You, your child, and all their friends will feel extra special this Valentine’s Day. You can ask your child’s teacher what they need, so we make sure we have an adequate spread for all the children! Some fun ideas to do with your healthier snacks is to give them a Valentine’s Day theme. One idea is to cut up fruit into heart shapes, such as watermelon. Additionally, you can dye certain dips with food coloring, such as cream cheese. We want to ensure that your children have an amazing Valentine’s day celebration at our child care center. If you have any questions or want to know more information about the kids within your child’s class, please contact our center in Glastonbury. 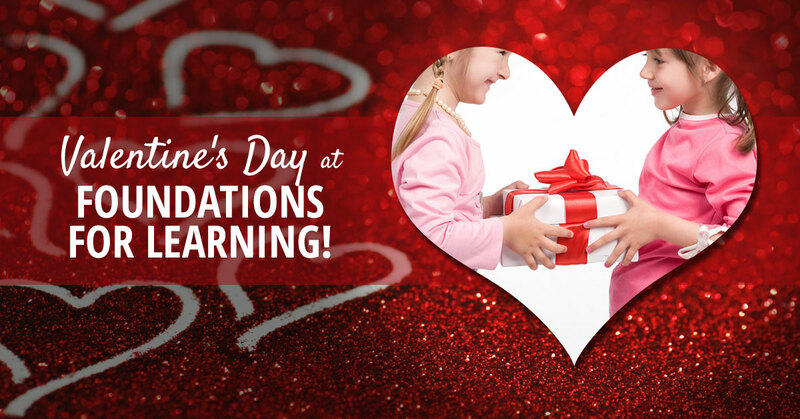 Help us make this the best Valentine’s Day yet at Foundations for Learning!